Austrian Chancellor Sebastian Kurz said on Wednesday that he considers it “absolutely unacceptable” to question the right of Israel to exist or call for the state’s destruction. Kurz has said this before, but what made it more newsworthy was that this time he said it at a joint press conference in Vienna with Iran’s President Hassan Rouhani sitting alongside him. Israel’s security wasn’t the only issue on the agenda to make Rouhani squirm on Wednesday. The case of one of its Vienna-based diplomats who was arrested in Germany over a suspected plot to carry out a bomb attack on an exiled Iranian opposition group, was at the top of the agenda. Iran promised to help clarify the matter, according to Reuters. The case cast a shadow over Rouhani’s visit to Austria, at which both sides discussed issues including salvaging the Iran nuclear deal after the U.S. decision to withdraw and reinstate sanctions on Tehran. 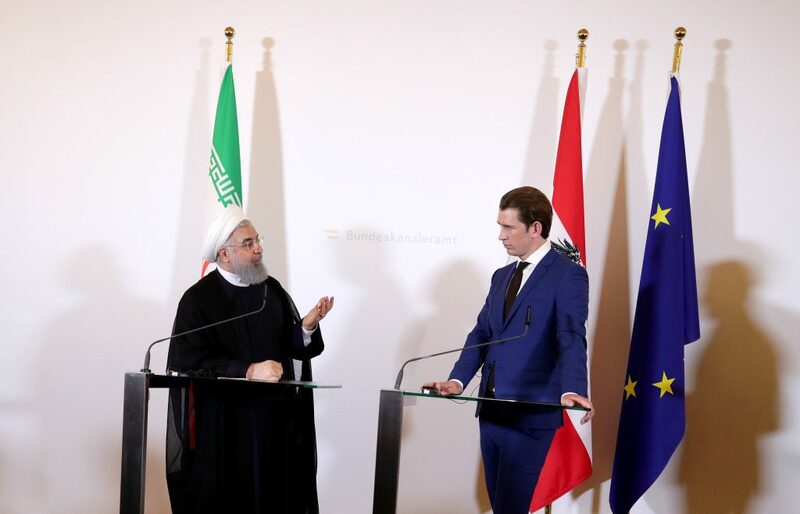 “We expect full clarification in connection with this and I thank you, Mr. President, for assuring us that you will support this clarification,” Austrian Chancellor Sebastian Kurz said in a statement to reporters after meeting Rouhani. Rouhani did not mention the diplomat in his remarks; and the two leaders took no questions. Austria summoned Iran’s ambassador over the case on Monday and said it was stripping the arrested Iranian of his diplomatic status. Belgian authorities identified the diplomat as 46-year-old Assadollah A, and said he is suspected of having been in contact with two people arrested in Belgium with 500 grams of the homemade explosive TATP and a detonation device in their car. Their alleged target was a rally near Paris last weekend of the National Council of Resistance of Iran (NCRI) — an umbrella organization of opposition groups in exile that seek an end to Shi’ite Muslim clerical rule in Iran. Belgium also issued a European arrest warrant for a man of Iranian origin being held in France suspected of being involved in the alleged plot, a French judicial source said. U.S. President Donald Trump’s lawyer Rudy Giuliani as well as former European and Arab ministers attended the NCRI meeting. The NCRI held a small protest against Rouhani’s visit on the edge of the area of central Vienna that police sealed off. Foreign ministers from the remaining signatories to the 2015 nuclear deal — Iran, France, Britain, Germany, Russia and China — will meet in Vienna on Friday to discuss salvaging the accord. European powers are putting together an economic package aimed at safeguarding the deal by shielding Iran from some of the impact of U.S. sanctions resuming. Rouhani has said Iran will stay in the accord if its interests are preserved. An Iranian official said Rouhani was also due to meet the head of the Vienna-based International Atomic Energy Agency (IAEA), which is policing the restrictions the deal places on Iran’s atomic activities in exchange for sanctions relief. Rouhani’s one-day visit to Austria followed a longer trip that was planned two years ago, but which he canceled at the last minute on unspecified security grounds.